Minds in Bloom is excited to have Belinda Givens on the blog today! 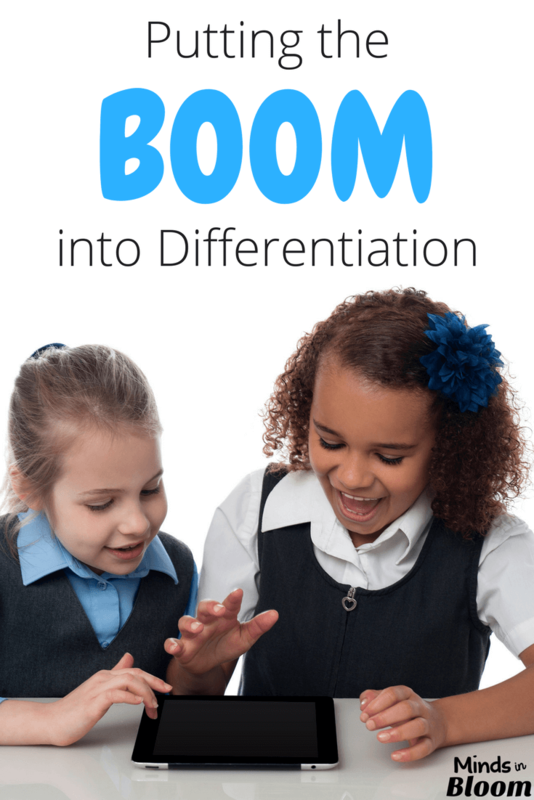 Belinda is sharing a great post with us all about differentiation using Boom Cards™ from Boom Learning, Inc. Enjoy her post below! We’ve all been there: small group intensive instruction and every student in the group is on a different level. You have a student who is answering all the questions, eager to participate and excited about learning. Then, there is the student who gets it but doesn’t really feel confident participating because they are not quite sure of their responses. And, of course, there’s a student (or two) who is completely lost and, instead of asking for clarification, tries to defer the attention away from themselves by exhibiting distracting behaviors to interfere with others. This is the challenge that we frequently face, and our mission is to differentiate or modify our lessons in such a way that we capture and motivate every student in the group. We want to provide a level of rigor that challenges our highest scholar while still presenting the material in a manner that intrigues, motivates, and encourages our lowest level scholar to begin to connect the dots. From my personal experience, I have come to realize that I get the best outcomes from my students when they are having fun and actively interacting with the content. Kids today love technology, and by incorporating it into my lessons, my students come alive and get excited about learning. I strongly feel that learning should be fun in order to keep students motivated and to ultimately foster a long love of learning. When I think back to my school-age years, the teachers that I remember most are the ones who were creative and who put forth their best efforts to offer a learning environment that was full of fun and engaging resources. Fast forward to the 21st-century classroom, and it is absolutely imperative to stay on the cutting edge of technology – from digital interactive notebooks to digital self-grading task cards, there are infinite possibilities to differentiate your instruction digitally, while captivating and motivating your students. 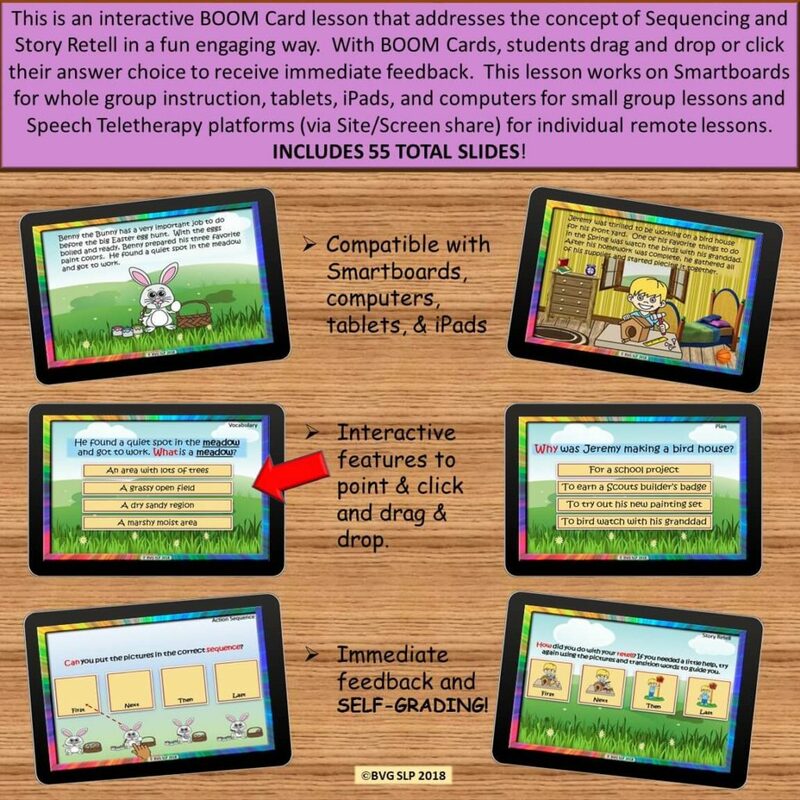 What I really appreciate most about Boom Cards™ is the fact that they are presented to my students in small, digestible bites, they have visual cues built in to aid in comprehension, and they incorporate technology, which is very motivating. 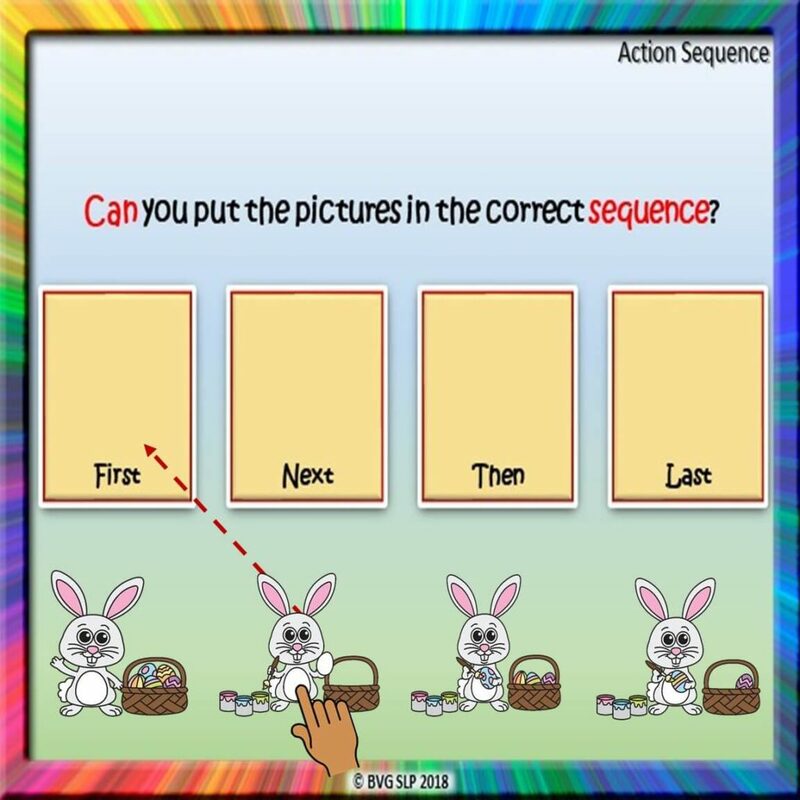 They also can be read aloud to students who need extra support, or you can challenge your students to demonstrate their ability to read, comprehend, and independently complete the task on each card. I also love the fact that my students receive immediate feedback, and the cards are self-grading! This saves me a tremendous amount of time with progress monitoring and allows me to easily pinpoint the areas that my students are struggling with most so I can offer increased repetitions and opportunities to master specific skills. Within small groups, I facilitate my Boom Cards™ lessons in such a way that every student is challenged regardless of their skill level. The interactive nature of the cards (point and click, drag and drop, and fill-in the blanks) naturally reinforce learning in a way that keeps my students motivated, and I spend the entire session focused on targeting important concepts and don’t have to devote time to external reward systems. When my students are excited, it certainly shows in the area that matters most, and that is better measurable outcomes. The increased attention level demonstrated by my students when using Boom Cards™ results in improved carryover from one session to the next, and therefore, we spend less time reviewing and more time on compounded growth. Whether you are a classroom teacher, an ESE teacher, or a Speech-Language Pathologist, we all share a common thread – we want to see growth and progress in all of our students. As a reading-endorsed Speech-Language Pathologist, my passion is language and literacy. I make a conscious effort to incorporate literacy into every session to maximize the time I have with my students. With the level of rigor that is expected from them in today’s classroom, I want to ensure that they thoroughly understand that what we do in our small group sessions is to better equip them with the tools they need to be successful in the classroom and beyond. For this reason, I have started a complete series of Boom Cards that target a wide variety of language and literacy concepts in each deck. 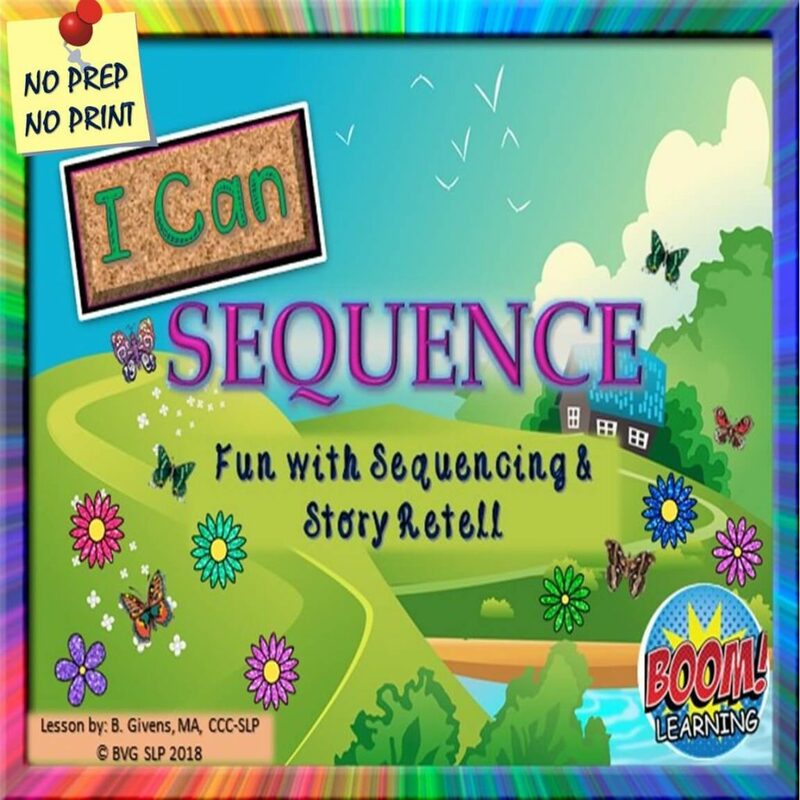 My Sequencing and Story Retell Boom Cards™ series is designed to address sequencing, identification of story elements, answering wh- questions, auditory comprehension, reading comprehension, vocabulary, use of context clues, and story retell. They are differentiated to encourage active participation from all students in a fun and engaging way. To help build the foundation for strong readers, I also have several Boom Cards™ decks that address important introductory skills, including rhyming words, phonemic awareness, sight words, synonyms, antonyms, and much more! Every deck that I create is designed with a focus on differentiation and can be used during whole group lessons, small group intensive instruction, 1:1 sessions, or independent assessment. 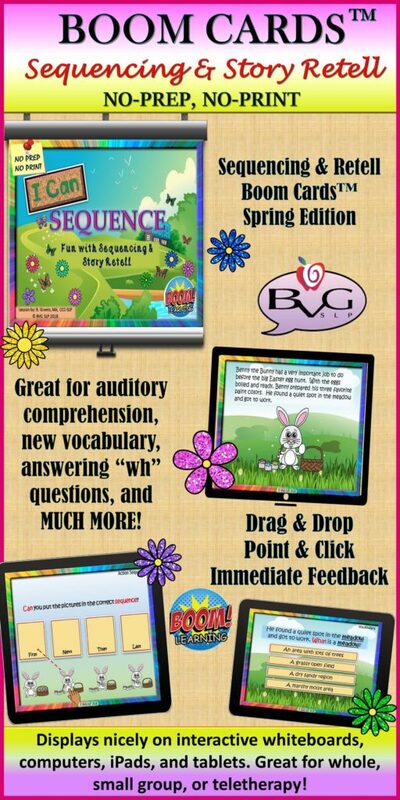 To find more of my digital interactive lessons, please visit my Boom Learning store HERE. Belinda Vickers Givens, MA, CCC-SLP has been an American Speech-Language and Hearing Association (ASHA) Certified Speech-Language Pathologist for 11 years. She is licensed in FL, CA, WA, and VT and is a member of ASHA’s Special Interest Group 18 for Telepractice. She currently works as a teletherapist serving PK-12th grade students. She holds her B.S. in Psychology with a minor in Education from Florida State University and her M.A. in Communicative Sciences and Disorders from the University of Central Florida. While pursuing her Master’s degree, she also earned an endorsement in Reading from UCF. She is the co-owner of Infinity Rehabilitation, LLC with her husband, who is an Occupational Therapist. She is the creator and owner of BVG SLP, which specializes in creating no-prep, no-print digital materials that are great for use in whole group, in small groups, within teletherapy platforms, or in face-to-face therapy. She is passionate about literacy and has written a children’s book (The Adventures of DemDem the Garbage Truck: Watch Out for the Bumps). She tries to incorporate literacy into the majority of her therapy sessions. Her products can be purchased from her Teachers Pay Teachers store. Belinda is the mother to three amazing young boys and enjoys taking road trips, reading, crafting, and exploring. She has been married for 15 years and resides with her family in Central Florida. 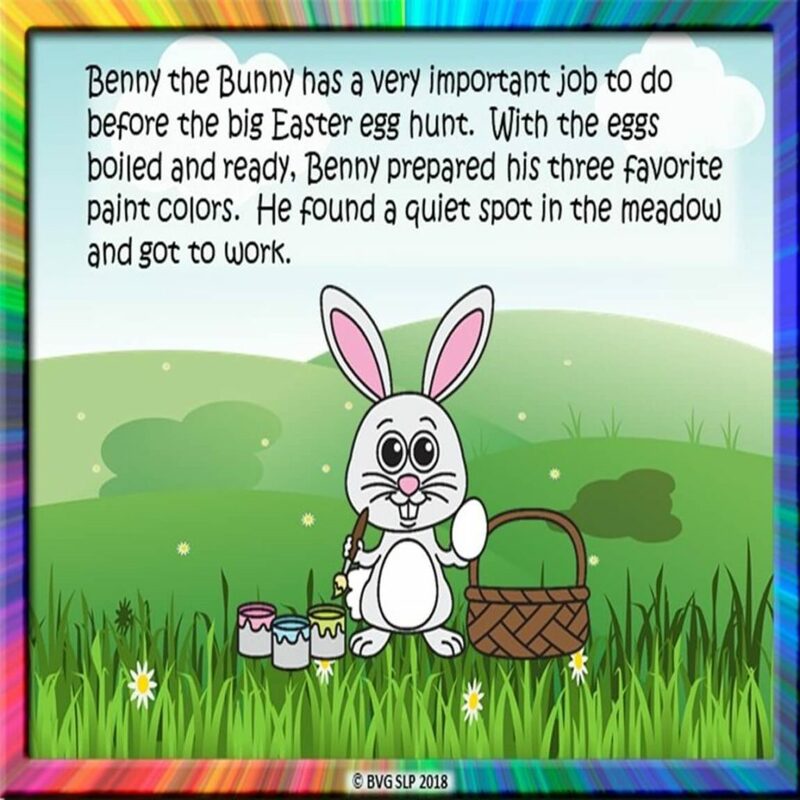 You can keep up with Belinda at her website, on Facebook, on Instagram, and on Pinterest. These are state-of-the -art BOOM cards. I can’t get enough!